Maeshowe is a Neolithic passage grave and chambered cairn. It was probably built around 2800 by the Neolithic people living in Orkney at the time. It's one of the largest tomb structures in Orkney, the mound is 35 meters in diameter and 7.3 meters tall. It is aligned so that the light of the setting sun on the winter solstice enters through the passage and illuminates a spot on the rear wall of the central chamber. Continue east along the A 965 highway toward Kirkwall. Just east of the crossing B 9055 road you will pass the Barnhouse Standing Stone, at National Grid location HY 312 121. The Barnhouse Stone, at left above, was a sighting stone for Maeshowe, a large chambered cairn and passage tomb visible as a mound at right. Below we are approaching the mound, about to pass through the surrounding henge or ditch and berm ring. Maeshowe dates from around 2800 BC. Its entrance takes you into a small entrance tunnel. That tunnel leads into a central chamber forming a rough cube shape about 4.5 meters on a side. There are other chambers off the other three sides. The whole thing is aligned and constructed so the light of the setting sun shines down the entrance tunnel, about 1 meter wide by 1.5 meters high, and some 15 meters long. 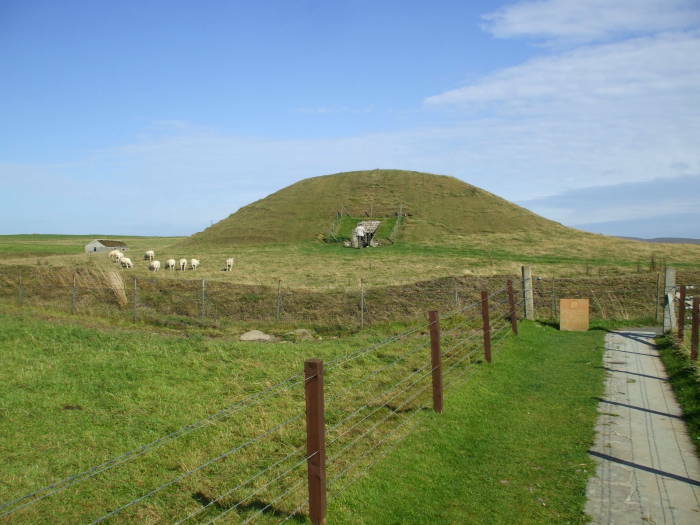 For loads of details see: "Maeshowe and the Winter Solstice: Ceremonials Aspects of the Orkney Grooved Ware Culture", Euan W. MacKie, Antiquity 71(1997):339-59. That paper discusses the alignment of the Maeshowe passage with sunset having a final brief re-appearance at north ends of Ward Hill and the Cuilags on the island of Hoy at the first and fifteenth "sixteenths" and the second and fourteen "sixteenths" of the year (29 Nov and 12 Jan, 4 Feb and 4 Nov), respectively, at least in the period around 2700 BC. Precession of the Earth's axis has slightly changed the alignment, although the solstice sunset is still aligned with the tunnel. 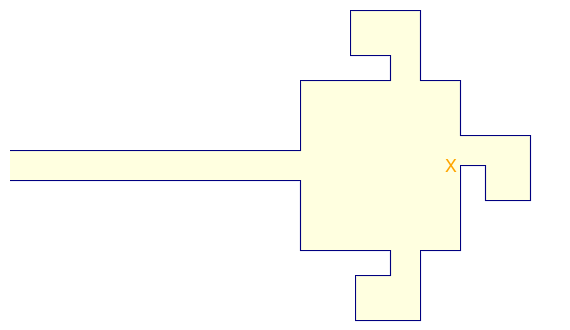 The interior construction is laid out more or less like the below. Unfortunately, access to Maeshowe is only possible on guided tours, and no photography is allowed inside. The entrances to the side chambers and their floors are maybe a little over a meter above the floor of the main chamber. The main chamber is about 4.5 meters on a side, the entry tunnel is about 15 meters long. "X" marks the solstice light. The Barnhouse Stone seems to be a sighting device, although it isn't clear if it was just used for initial construction or if it had some continuing use. 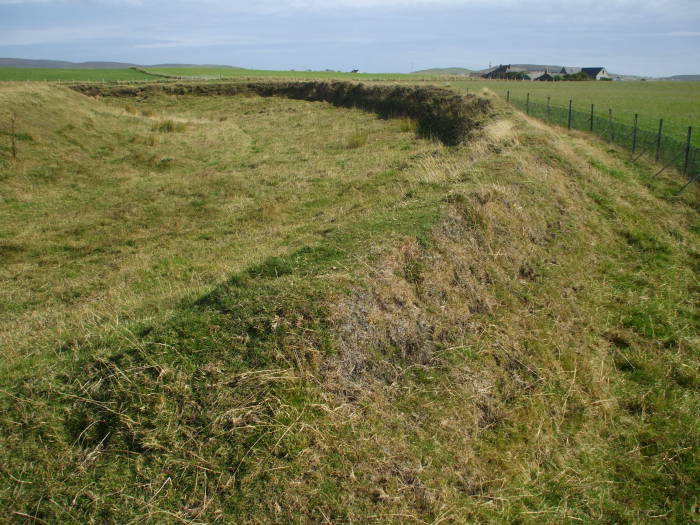 A henge construction, a circular combination of berms and ditches, surrounds the mound from 15 to 21 meters out. 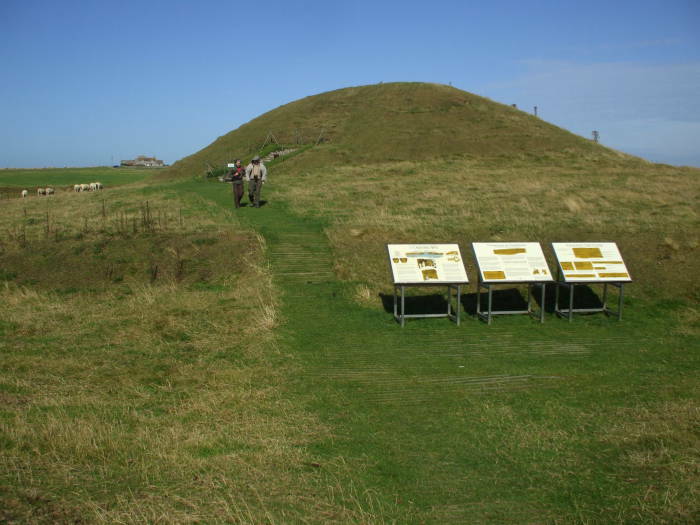 The Maeshowe mound itself is 35 meters in diameter and 7.3 meters tall. The grassy mound hides a structure built of carefully crafted slabs of sandstone weighing up to 30 tons each. It is commonly estimated that about 39,000 man-hours of labor were required to build Maeshowe, although Colin Renfrew calculated that about 100,000 man-hours would be needed. Its original use ended during the Bronze Age. Centuries later, in the 800s through 1100s AD, the Norse Vikings dug into the mound in search of treasure. They called it Orkhaugr. 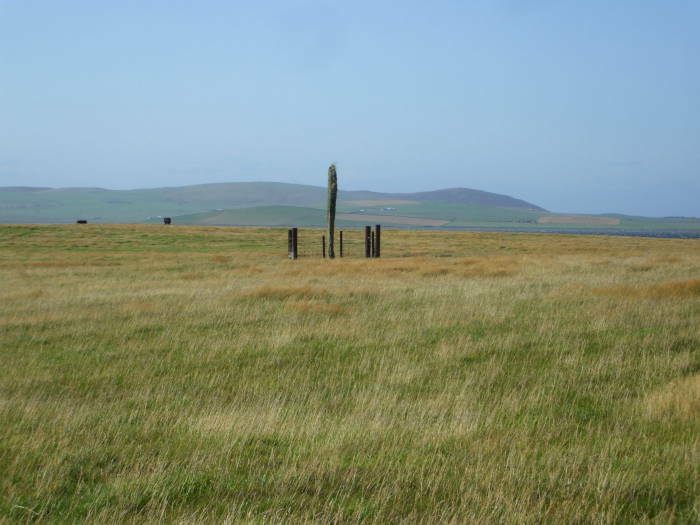 The Orkneyinga Saga describes how Earl Harald Maddadarson and Ragnvald, the Earl of Møre, looted the mound. It was probably a reasonable guess, but there was nothing inside. The Norsemen used the mound as shelter during those centuries, and carved a number of runic inscriptions into the walls. It's the largest collection of runes anywhere outside Scandinavia. This view across the Barnhouse Stone, more or less to the northwest and at a right angle to its intended sighting direction, shows how thin it is. The Stones of Stenness and the Barnhouse Settlement are our next stop.